It’s hard to believe that heathland is one of our most threatened habitats, rarer even than rainforest. Heathland can be somewhat open and featureless, which makes finding a composition challenging. Try to keep it simple, aiming to capture the spirit of the colourful spectacle without showing it all and use elements such as a lone tree on the horizon or a pathway cutting through the heather to act as a lead-in line. Heather flowers in late summer, a time of year when the light can be rather harsh during the day, so it’s worth getting out for the golden hours at the start and end of the day. Aside from the obvious prospect of a dramatic sunrise, the low angle of the light as the first rays of sunlight splash across the landscape adds shape and texture to the heather. There’s no need for any special equipment. I took most of my shots between 24-40mm, a range covered by most kit lenses or compact camera zooms. A telephoto lens is useful for picking out details and when wildlife that lives among the heather makes an appearance. It’s worth slipping a couple of filters into your kit bag: a circular polariser to make the most of the riot of colour and a graduated ND filter to keep those early morning (or evening) skies under control. 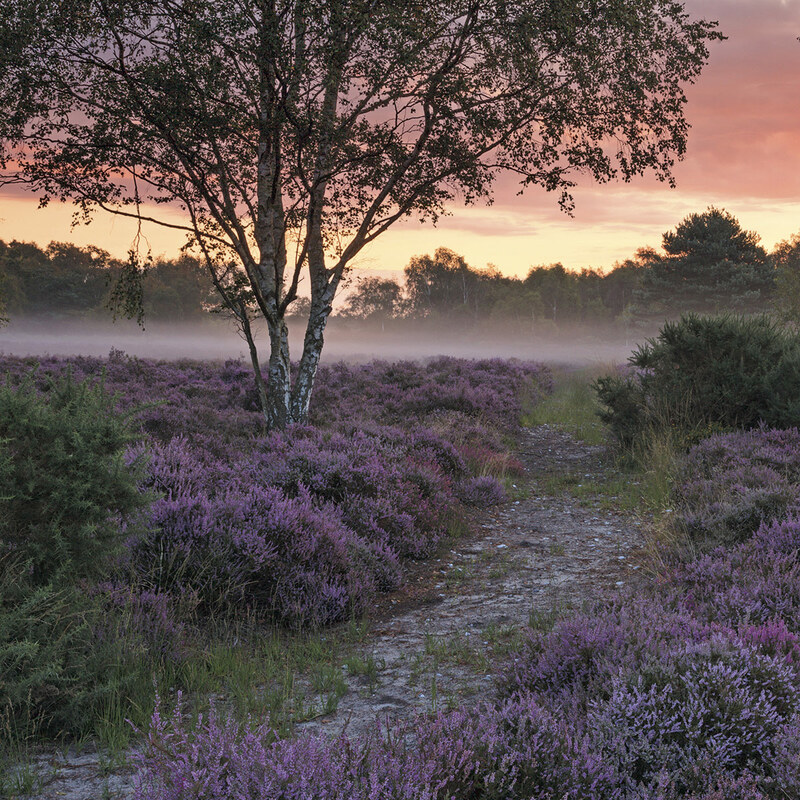 With its bold colours and stark contrasts, heathland can be a great place to experiment with different techniques. Try forsaking the small apertures and resulting shallow depth of field usually favoured for landscape images and shoot wide open, preferably with a telephoto lens. 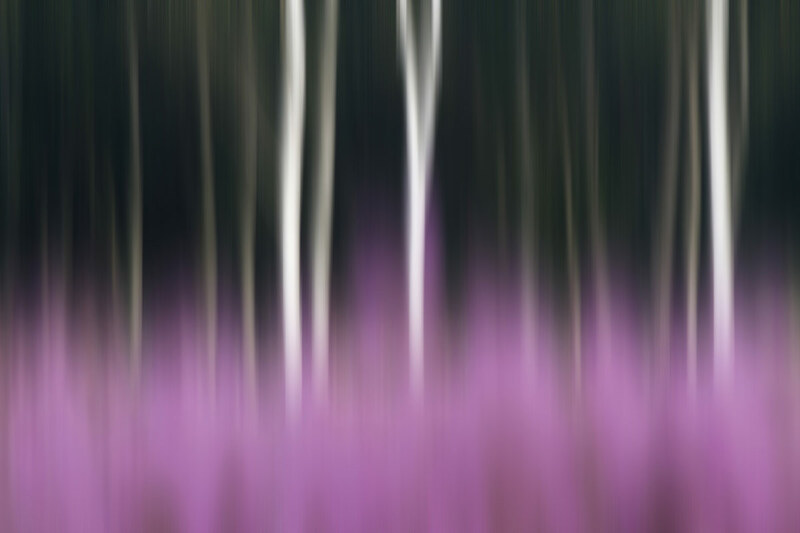 Focusing on a point of interest in the distance, a lone tree for example, will render the foreground heather as a glorious pink blur. You can take this a step further by using intentional camera movement (ICM), a technique that involves deliberately moving the camera during the exposure. There are endless possibilities and permutations with ICM and a lot of trial and error to get something you’re happy with, but it’s a lot of fun. In this example above, using a fairly slow shutter speed I moved the camera smoothly from the tops of the trees down to the heather, pressing the shutter button halfway down. As always with landscape photography, a tripod is essential. It not only ensures your shots will be sharp, but also slows the whole process down, giving you time to consider your composition and make sure you nail the exposure. the sun can burn it off quickly. Clear mornings will ensure you get nice warm sidelight on the heather. Although the sea of colour is the obvious attraction, don’t overlook the details. Dew-covered spiderwebs, butterflies or backlit individual flowers can be picked out with a telephoto or macro lens and the colours of out-of-focus heather make a great backdrop. July and August, when the flowers are in bloom, are the best months for capturing heather, but autumn brings a range of earthy tones that combine beautifully with the gold and russets of the ferns and trees.